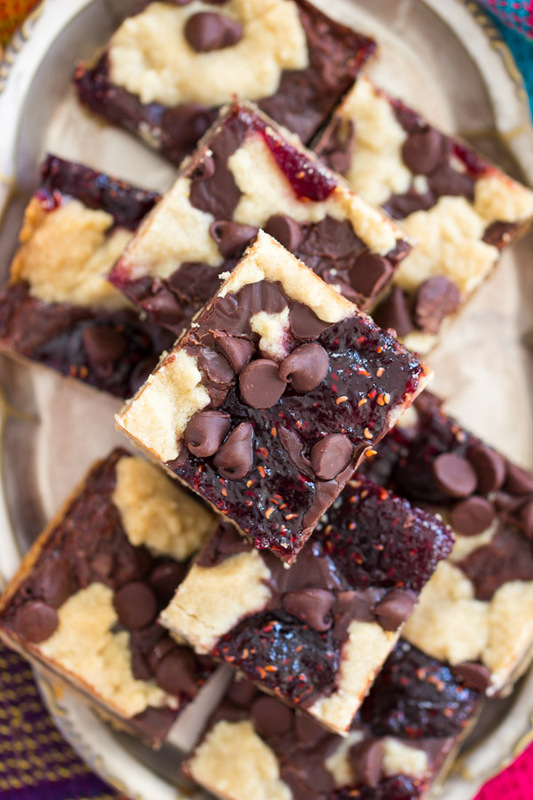 These Raspberry Chocolate Chip Bars feature a buttery, shortbread-like crust with dollops of raspberry jam, a fudgy chocolate layer, and chocolate chips. Simple ingredients come together into something spectacular and refreshingly easy. Happy, happy Valentine’s Day! How excited are you for this holiday?? 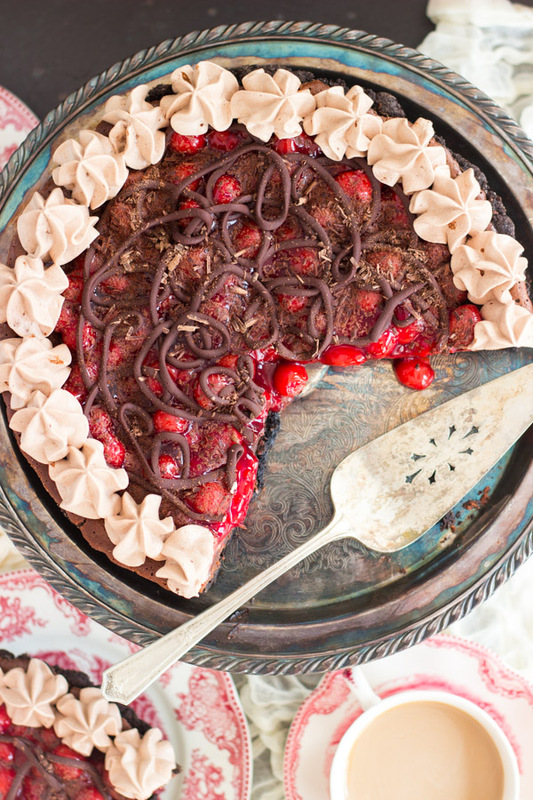 If you’re like me, probably not much, except for an excuse to splurge on chocolate and berry desserts. My S.O.’s back has been out for about a month now, and he awaits MRI results – hopefully they are positive. On top of that, he has a nasty cold, so he is working from home. I work from home quite a bit too, so all that really means is that he’s hogging the internet bandwidth. I keep needing to restart my computer, so it’s taken about 45 minutes to write these few sentences! So that’s what my Valentine’s Day looks like. Work, sick S.O., and I have a doctor’s appointment myself later today. FUN. I hope your plans are more exciting than this! 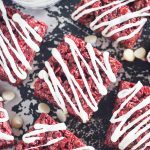 Today I share with you a seriously wonderful gem of a recipe. 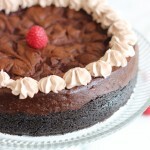 It’s fitting for Valentine’s Day, and it comes together quickly for a last-minute option, but it also works for anytime. I spent January on massive spring cleaning binge, and I discovered a really old Nestle cookbook in my kitchen. It was ancient, so I thought the recipes might be outdated. Worse, the book had virtually no pictures. I didn’t know what anything looked like. Who wants to experiment with recipes where you can’t see a finished product? 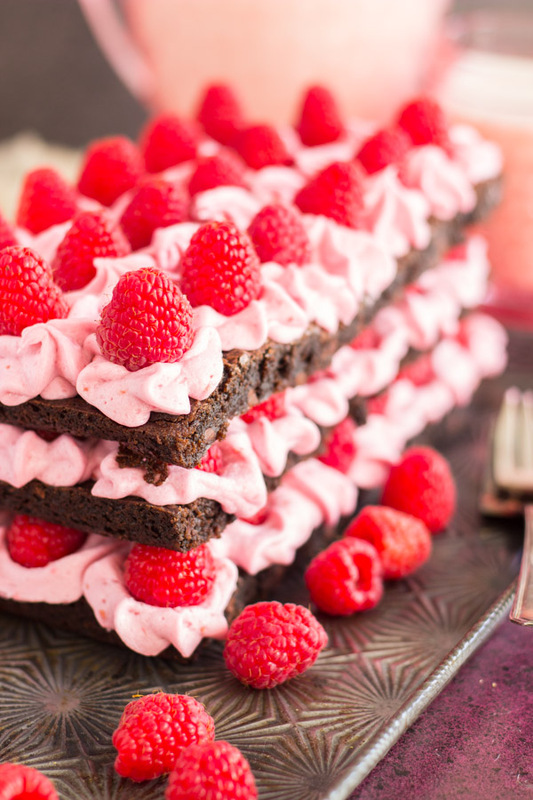 Still, these Raspberry Chocolate Chip Bars caught my attention. I scanned through the recipe, and the ingredients looked simple, the instructions were simple, and the flavors sounded divine. This recipe is a diamond in the rough of that crappy, imageless cookbook. 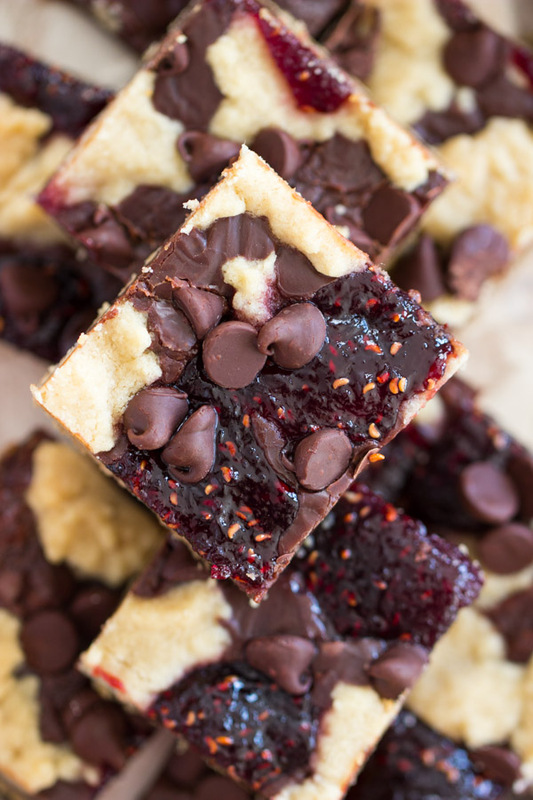 Raspberry and chocolate together have such a romantic and enticing vibe, and so I’m always attracted to recipes featuring that combo in the first place, but these bars also start with a buttery, brown sugar, shortbread-like crust, and are topped with little crumbles of the crust on top. 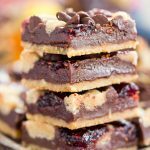 Besides the lovely crust and dollops of sweet raspberry jam, my other favorite component of these bars is the fudgy layer of chocolate in the middle. It’s only chocolate chips melted with sweetened condensed milk, but WOW is that a brilliant move. 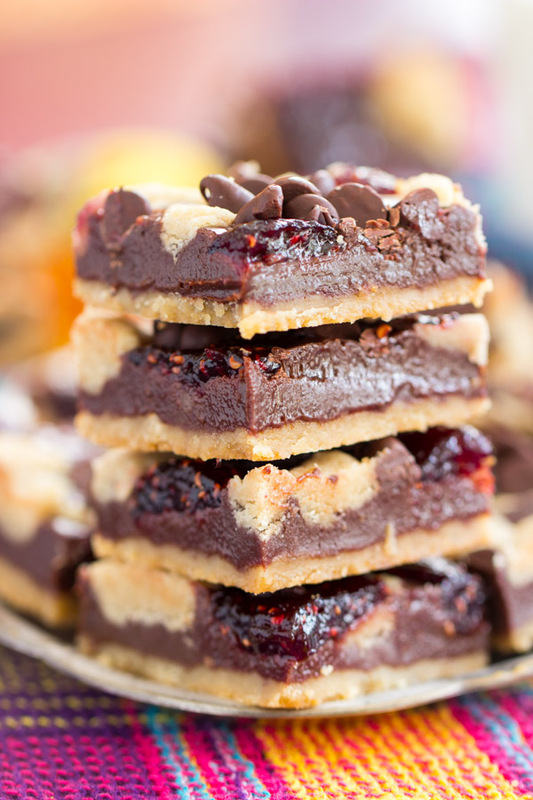 That layer bakes into a soft, rich, and fudge-like filling. 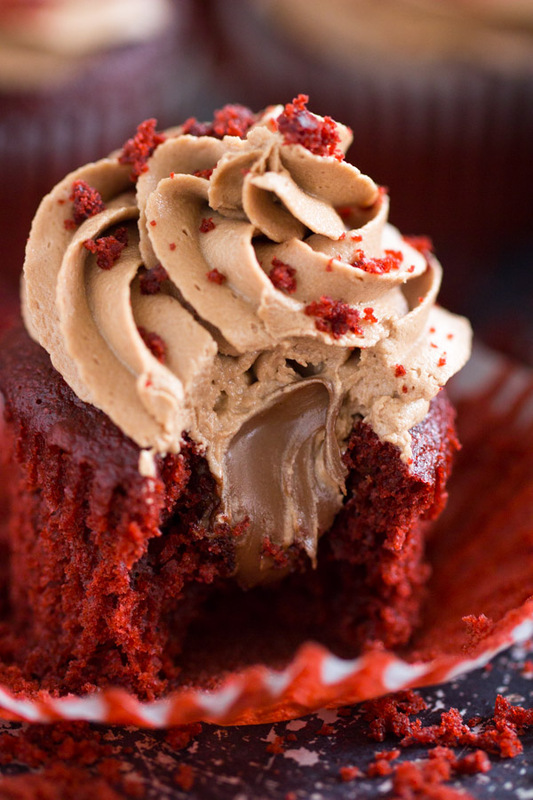 Super decadent. 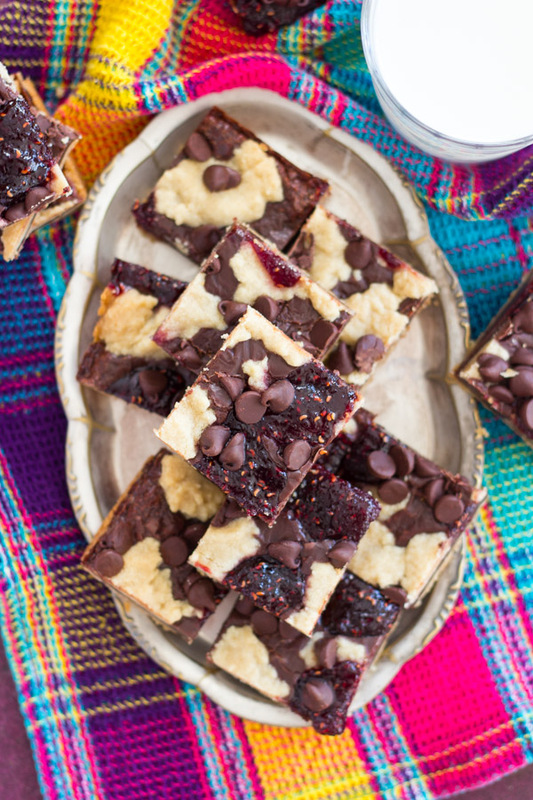 With dollops of raspberry jam, and a smattering of chocolate chips on top, these are just straight-up delicious. Not a complex bar at all, but the simple ingredients join up into something spectacular, and blessedly easy to make. 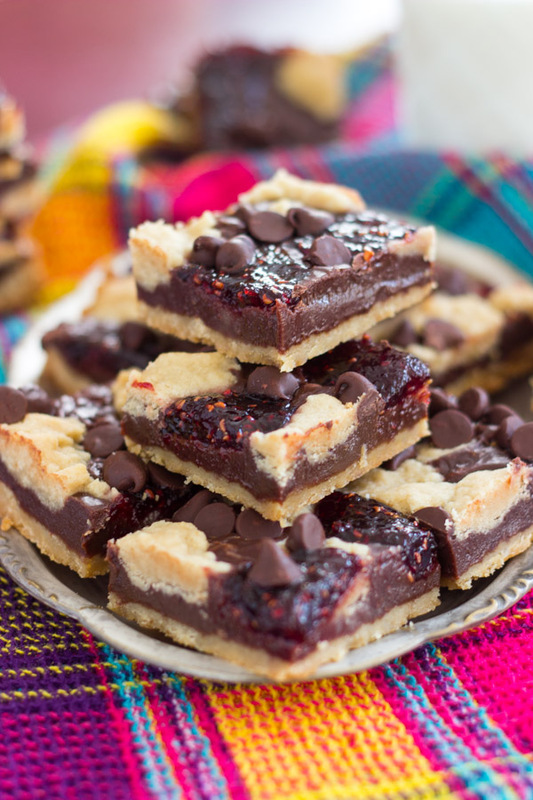 A bar with a buttery shortbread-like crust, dollops of raspberry jam, a fudgy chocolate layer, and chocolate chips! Beat in flour and brown sugar. Press 2/3 of the batter into the bottom of a parchment paper-lined or greased 9x13-inch baking pan. Bake at 350 degrees for about 10 minutes, or until edges are golden. Remove from heat. In a medium microwave-safe bowl, combine 1 cup chocolate chips and can of sweetened condensed milk. Heat on high for 1 minute. Stir, and microwave for additional 15-20 second intervals, or until mixture is smooth. 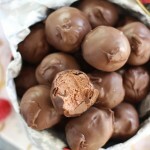 With the remaining batter, shape into small flattened disks or break off small bits of batter, and scatter them across the chocolate mixture. 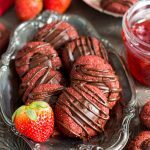 Drop teaspoonfuls of raspberry jam over the chocolate and batter, as randomly as you'd like. 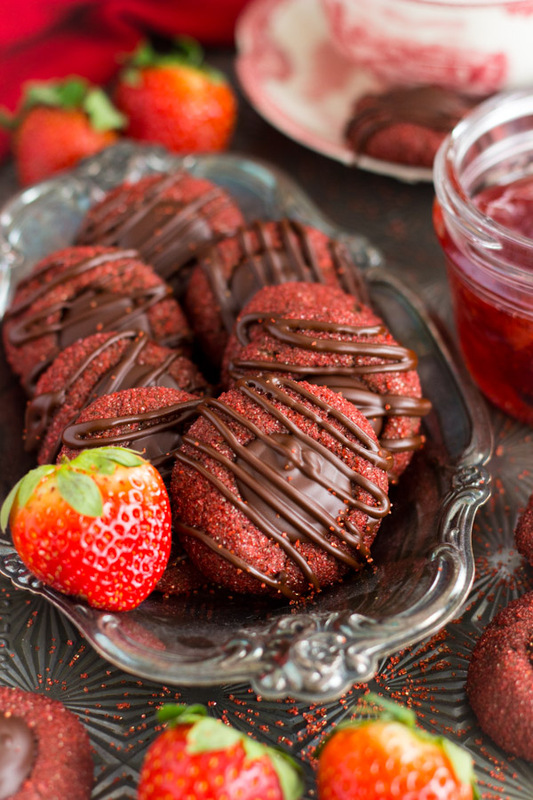 A lot of the chocolate mixture may not be covered by batter or jam, and that's fine. Bake for 25-30 minutes, or until the edges and top are golden brown. 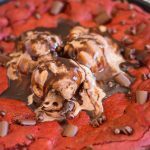 It may still jiggle - jam and chocolate will set as they cool - but the edges and the dough on top should be golden. Remove to a wire rack to cool completely. Once cool, a short chill in the fridge, 30-60 minutes, can help achieve cleaner cuts when cut into it (optional). Cut into bars. Cookies will keep well in airtight containers for up to 7 days. 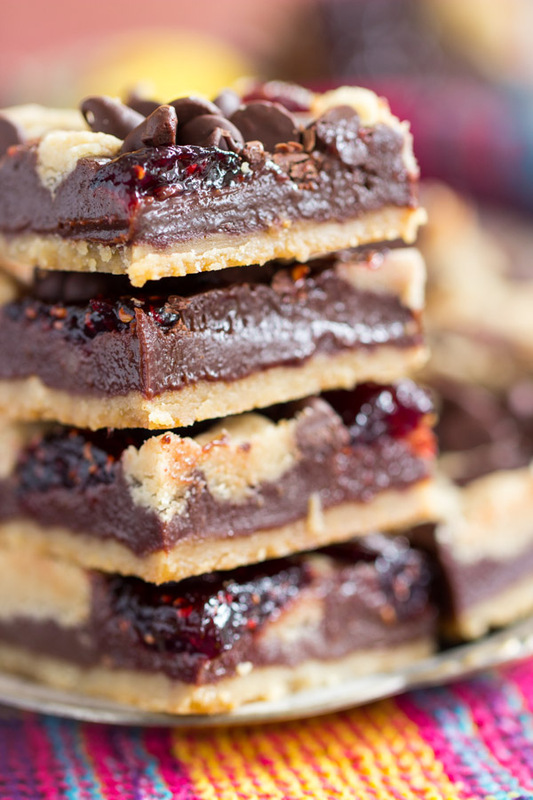 I've also made these bars with milk chocolate, and they are superb! I've tried these with white chocolate, and they do not work.... please do not substitute white chocolate. Love how easy these are! Happy Valentine’s Day to you!!! These look crazy delicious!!! I love bar cookies and this looks like a dangerously addictive flavor combo.